Hello, and welcome to my spot on the interweb. My name is Katie, and I love to sew and quilt. Let's stop the small talk now and get right to the giveaway... That's six fat quarters of lovely Art Gallery Fabric! This giveaway is open to all. I will be happy to ship internationally. The giveaway will continue through Wednesday, May 13, and will end at 5 p.m. PDT on the 13th. The Random Number Generator will choose the lucky winner. Make sure there is a way for me to reach you. If you are unsure, then just write your email address in a comment. **********UPDATE********** This giveaway is now closed. 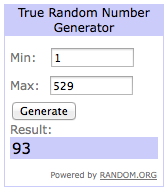 Congratulations to Michelle, commenter #93! Thank you to everyone who participated! Thank you so much for visiting my blog. I hope you will follow and check back often to see what I'm up to. Hi Katie! These are beautiful fabrics - I just can't get enough orange. Hello! 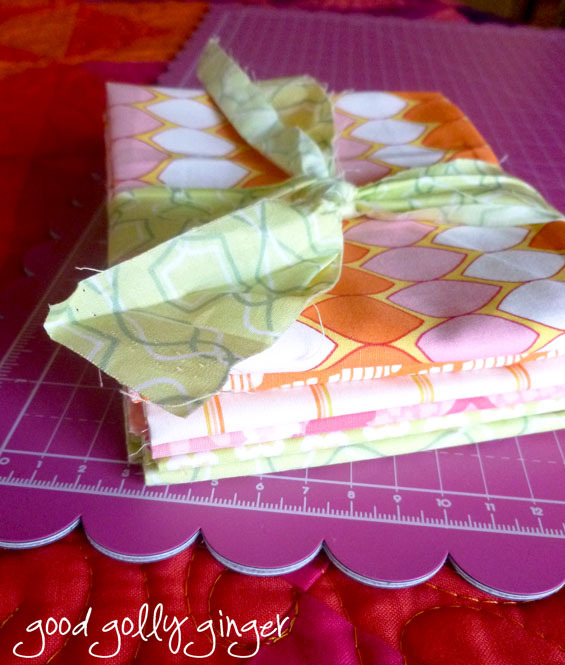 You have chosen really lovely fabrics for this giveaway! Orange is my favorite color! Perfect giveaway for me! Such lovely fabrics! I love how Art Gallery fabrics feel. I love Art Gallery Fabrics, they feel so nice! I follow you via Bloglovin' and I really enjoy reading your blog! Thank you for a chance to win such a lovely giveaway. Hi Katie, that's a lovely range of fabrics. Thanks for the chance to win it. Oh, such beautiful fabrics. They would make a lovely spring tablerunner. Thank you for this giveaway. Hi Katie! Nice choice of fabrics for your giveaway! I currently follow you by email but I've been a follower since you shared your Home for Christmas Medallion! Gorgeous selection!!! Art Gallery fabrics are on the top of my list too!! I follow you via Bloglovin!!! Thanks for the chance!! Good Morning - I hope you have a fabulous day! thank you for the giveaway! Hello! My stash could really use some orange and these are beautiful. Hi! Love your site. Thanks. I love your blog and follow you on bloglovin. I have found so many new "friends" who enjoy the same things I do all over the world through blogs. I enjoy reading them everyday and following the progress on projects and what life is like where they live. Love Art Gallery fabrics - what good taste! I follow Good Golly Ginger via my Blogger Dashboard. Hi! Have a wonderful day. Such beautiful fabrics in your sweet giveaway! I follow you around on Bloglovin. Hi from Alaska! Such cute fabrics! Hello Katie! What a great giveaway! Thanks for the chance to win. Hi Katie, nice offer -- thank you! I follow you with Feedly.. thanks..
Hi Katie! Thats a lovely bundle of fabric. Hi Katie :) That fabric is gorgeous! Hi Katie. I love the fabrics you chose to give away. What a fun project they would make. Thanks for the opportunity. Hello! I really like the design of your blog -- so fresh & happy! Lovely colors in this bundle! Thank you so much for the opportunity! Hi Katie! Great summery colors in your bundle. Thanks! Good morning from Maryland, USA! Those are lovely fabrics, very spring-y! I follow your blog on feedly now! Hello!!!!! Thanks for the opportunity! Just saying hi from Sonora, CA. Thank you for being a part of the SMS Giveaway Day and giving me the chance to win those lovely FT which will certainly make a nice spring quilt. Hello! Lovely springy bundle - thank you! What a gorgeous bundle. Thanks for the giveaway. I just started following you on Bloglovin'. I love reading your blog by email! Beautiful fabric for the giveaway too! Hi, Katie! Isn't Art Gallery fabric the best? What a soft, pretty collection of prints! Thanks for the chance to win. Hi and thanks for the chance to win! beautiful fabrics, love the bright colors. I have a soft spot for anything Art Gallery Fabrics creates. Thanks for participating in the SMS giveaway. Hi! I just bought 4 yards of AG fabric to make a maxi dress. Too bad I have to print and assemble the pattern pieces before I can start sewing! I follow you through feedbin. Hi! I just love that bee hive print. Hi y'all - lollowing you on bloglovin! Thanks. Hi! Those are such great colors! Hi! And happy giveaway day! Hello from a fellow Katie!! Thanks for the giveaway!! Hi! 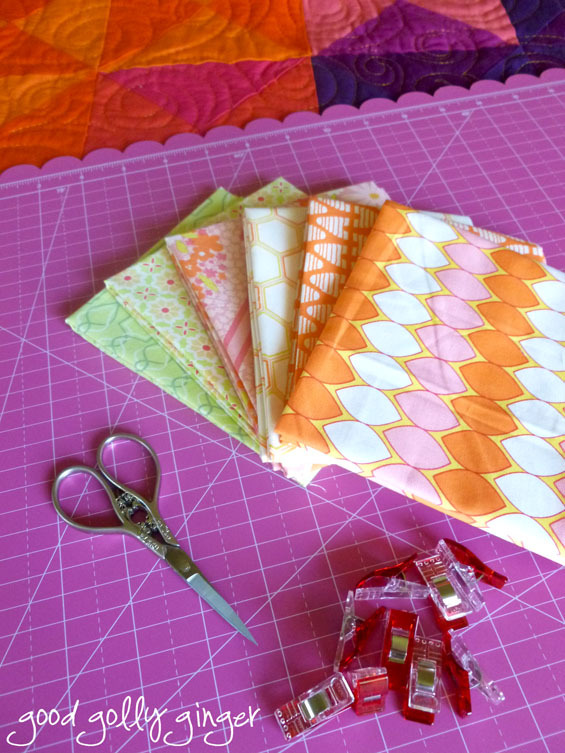 Love the orange fabrics ...one of my favorite colors! Hi Katie, from another Katie! Thanks for the chance to win! I just love the name of your site. Can't wait to poke around some more and get inspired. Lovely selection of fabrics! Thanks for the chance to win. I follow through BlogLovin. Fingers Crossed, Thanks for a great giveaway prize. So pretty! Come visit my crochet blog. Stopping by to say hello and compliment you on your lovely work. I follow on BlogLovin. This is my 2nd comment to you. Fingers Crossed! I'm following you via BlogLovin! Great prints, I love the colors for springtime! I follow via email, thanks! Thank you for participating in this giveaway opportunity! Hello Dear! 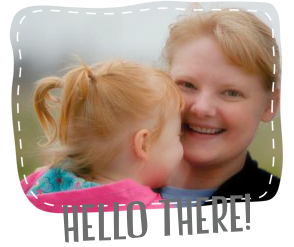 I am a newbie quilter so this giveaway day gives me a great chance to "meet" new people that quilt and blogs to follow! thanks so much for this awesome prize! I ADORE Art Gallery Fabrics. So far they are my very favorite to use. I sure do follow you on bloglovin and LOVE your blog! Thanks so much for the chance to win in the giveaway! I've added you to my feeds on Inoreader. The best thing about the SMS giveaway is that I always discover great new blogs. That bundle looks gorgeous!!! I love Art Gallery fabrics and orange in my quilts. It always gives them such a cheery little pop. I follow your blog on Digg reader! Hi :) And thank you for the giveaway! Such pretty Spring fabrics. Thanks for the chance. I love the fabrics you've chosen to give away! Why, hello! Thanks for sharing! Thanks for the opportunity! These are lovely! Hi! Love your pink scalloped cutting board! Hi, Katie! Thank you for the pretty fabrics you've chosen to giveaway. I follow Good Golly Ginger by email. I want you to know that I simply love blogging name you've chosen... Happy Mother's Day, BTW! Hi Katie! The giveaway fabrics you have chosen are lovely. HI such pretty fabrics you have chosen. thanks for a chance. Hi! I think your gypsy wife quilt is so pretty. I've been following you via bloglovin. Hi! and that stack of fabric looks sooo pretty! Hi! from sunny North Carolina. Thanks. I'm already a follower via Bloglovin' - thanks again. Hi - thanks for choosing such beautiful fabrics to share. I love when you post on Crazy Mom's Friday linky party. Oh what a delightful bundle! Thanks for the chance.